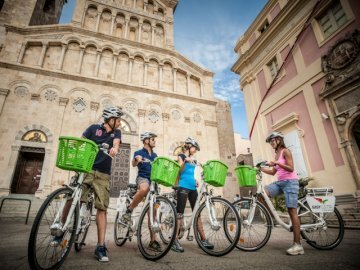 Explore Sardinia's capital by e-bike! 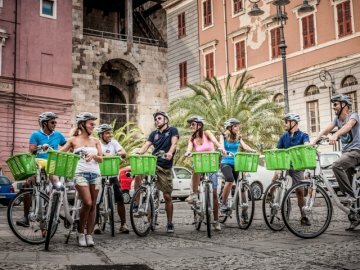 With a guided tour, you will discover Cagliari's unique characteristics cycling along its paths and via hidden corners around the city. Your tour guide's expertise and historic knowledge will provide an interesting and fascinating experience when visiting ancient churches, monuments and nature, often unknown yet full of beauty, charm and history. Book the tour which suits you best and let's go! This tour will introduce you to the most beautiful “green” corners of Cagliari along its boulevards, gardens and natural monuments. Historic and botanic gardens provide a history of the city, its centuries-old plants and vegetation. You will visit the shaded Moreton Bay fig trees in the “Giardini Pubblici” and the Buoncammino pine trees, and learn about the history of the Villanova street gardens. The tour will conclude at the beautiful Monte Urpinu park. This tour will introduce you to the rich historic history of Cagliari by touring its ancient buildings, churches and fortifications. 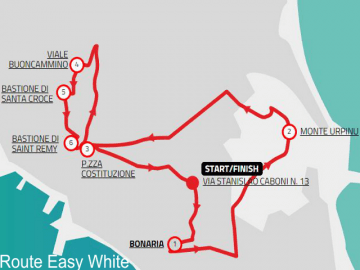 Starting from the Centre of Cagliari, the tour will take you through its medieval areas, the quarters of Castello, Stampace and Marina, and includes Cagliari's symbols of the Elephant Tower, S. Efisio and S. Saturnino. 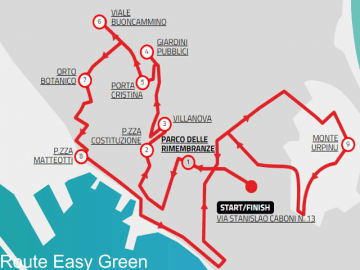 This tour offers spectacular views of both the city centre and the sea via the white calcareous hills of the city. 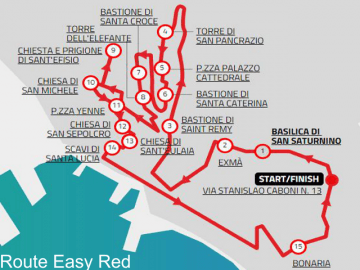 Starting from the Bonaria hill, which dominates Su Siccu sea and overlooks the medieval citadel of Castello, you will cycle to the the nineteenth-century boulevard of Buoncammino, view the port and Santa Gilla lagoon, and head towards the walled quarter up the Saint Remy and Santa Croce bastions. 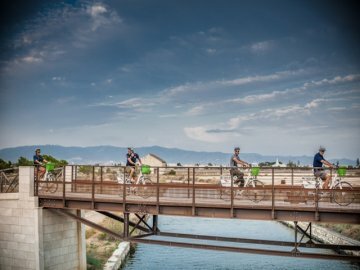 Starting from the port you will cycle along the coast up to the Terramaini canal to the Natural Park, passing through the “City of Salt”. From here, you will continue along the Poetto beach area and cross the Cape which separates it from Calamosca, the final destination, previously viewed from the higher ground of the eponymous lighthouse. 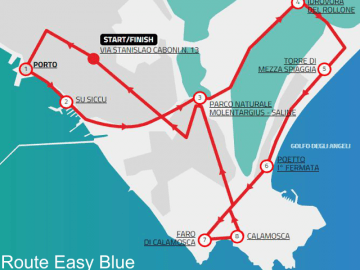 What a nice way to explore Cagliari! Fantastic bike ride, a must for everyone! 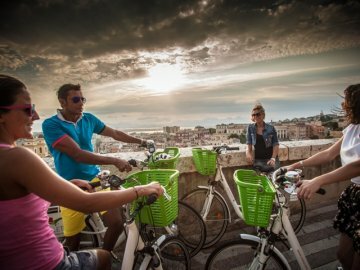 Rates are per person per tour and include an (electric) bicycle and helmet. *Cycling with young children? Please enter the number of the (adult) participants and add a bike seat afterwards. We made a fantastic bike ride (Easy Blu) of 5 hours with 2 enthusiastic leaders, Juna and Valeria. A must for everyone, especially to support their own business; a beautiful and environmentally friendly alternative.